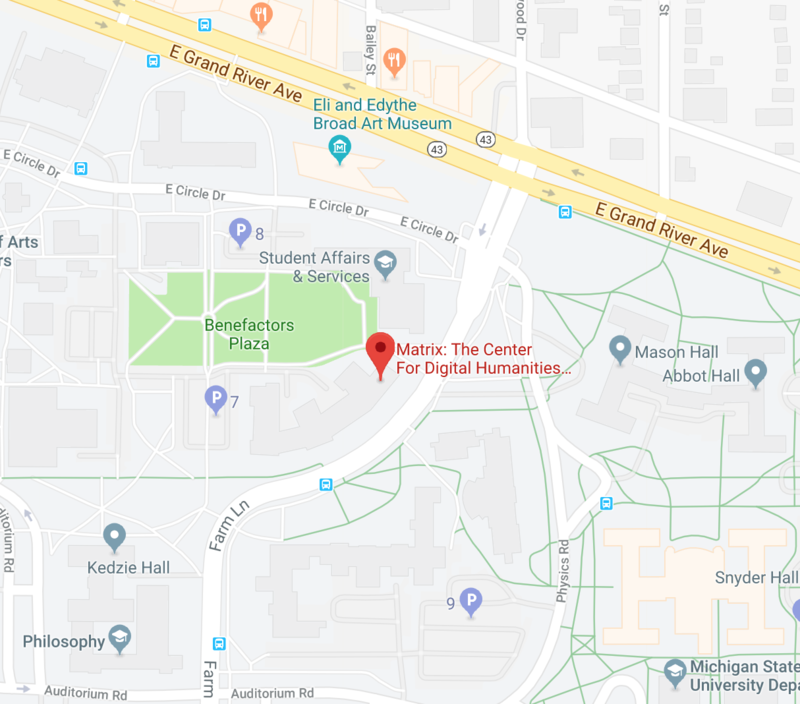 Matrix, the Center for Digital Humanities and Social Sciences at Michigan State University, is an international leader in digital humanities that advances critical understanding and open access to knowledge through application of humanities technologies for teaching, research, and outreach. Humanities technology unites the humanists quest for deeper understanding of humanity with the tools and methods of computer science, engineering, and information and library sciences. Matrix researchers work at these intersections to advance a wide variety of interdisciplinary projects. At MSU, Matrix works with partners across disciplines to build globally-networked resources and services that give life to the metaphor of "matrix": an interconnected environment that supports the development of new tools, ideas, and applications of interdisciplinary research. Matrix also partners with external organizations such as museums, libraries, and archives to digitize collections of cultural resources significant for public access and education. Currently, Matrix houses major digital library repositories including the African Online Digital Library (AODL), Detroit Public Television’s American Black Journal video archives, Historical Voices, Quilt Index and What America Ate. Matrix is committed to collaborating with developing countries and partners with limited resources, and we use inexpensive hardware and open-source software, combined with training for sustained use of such resources, to facilitate this. Matrix’s work is funded by Michigan State University and by external funding from many sources, including the National Science Foundation, the National Endowment for the Humanities, the Institute of Museum and Library Services, the U. S. Department of Education, U.S. Department of State Office of Citizen’s Exchange, USAID, and the Ford and Andrew W. Mellon foundations. We welcome your support of our ongoing work. As scholars, publishers, and teachers, we are both producers and consumers of digital objects, and we are committed to the free flow of ideas and to respect for intellectual property. Guided by basic scholarly and humanist values of excellence, education, access, and inclusiveness, and conducted according to proven, collaborative, scientific methods and principles, Matrix aims to be one of the top humanities technology centers in the world. To this end, the mission of Matrix is... ...to serve as a catalyst for and incubator of the emerging fields and disciplines resulting from the integration of the humanities with information technologies.